The Lakers needed that win. This week has been one of the worst weeks for the team and their fans. With the Anthony Davis trade playing out so publicly, it shined an unfortunate light on the team. The young guys were thrown under the bus and subject to repeated trade rumors while the front office engaged in “mudleaking” with other teams. Luke Walton’s handle on the team and Lebron James’ motives were constantly questioned. LaVar Ball opened his mouth again. The Lakers hit rock bottom in the past few days when they lost by a whopping 42 points to the Pacers. After that they couldn’t close a deal to land Davis and had to deal several young players before the deadline. After all that drama, the Lakers went into a rivalry game against the Celtics in Boston with questions hanging over their head. No one knew what LA’s mindset would be as they took the floor against the Celtics. They answered all the questions with a statement win over the Celtics. The best thing about this win for the team and their fans is that the key players of the supposed trade package to the Pelicans were the ones that stepped up. After falling behind by as much as 18-points in the first half, the Lakers came roaring back in the third period. Their outside shooting propelled them to a 42-point quarter by hitting nine three-pointers during that stretch. They turned a nine-point half time deficit into a six-point lead. The Lakers also battled back from a six-point deficit in the final 1:24 of the contest to win the game. Brandon Ingram didn’t have the best game offensively. But defensively, he was a huge factor. Coach Luke Walton praised Ingram’s defense in his post-game presser. It wasn’t just Walton. Even Irving, praised his primary defender’s effort on D.
Kyrie said the Lakers length impacted him tonight. Singled out Brandon Ingram in particular. Kyle Kuzma found his range in the second half. He nailed five three-pointers in the second half to carry LA’s scoring. 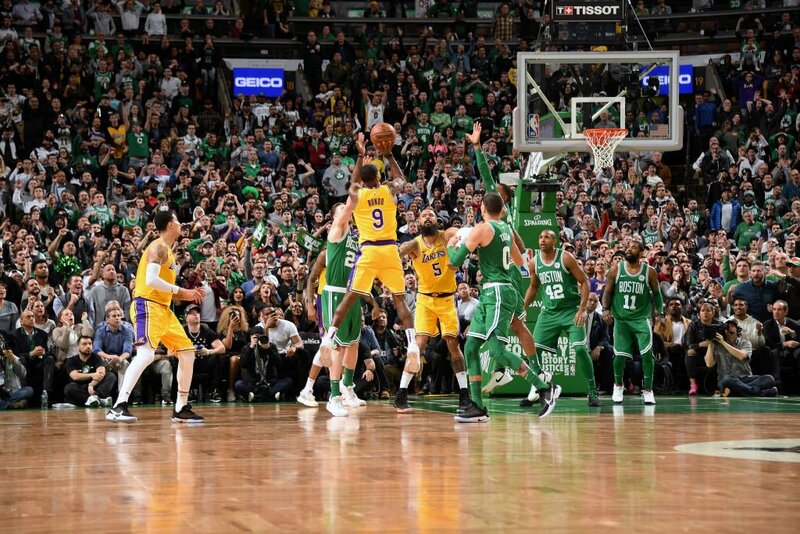 He nailed a floating layup in the final minutes and drilled a big three-pointer with 20 seconds left in the game to give the Lakers a one-point lead. Kuzma finished with 25 points and five treys. And of course there was Rajon Rondo. He shrugged off all the trade rumors and went to work today. Rondo had 17 points, seven rebounds, 10 assists and three treys. His game-winner at the buzzer was extra special as he did it against his former team, the team he won a championship with. Oh, and that LeBron guy was pretty solid too. He finished with a 28-12-12 triple-double and had several big three-pointers in the final minutes of the game. This could be the win that helps the Lakers move forward from all the insanity of the past two weeks. They have no choice now but to come together once again and make the most of the season. This game was one where the veterans and the rookies, the mainstays and trade fodders, all got together to win against a tough opponent. This could be the win that galvanizes the Lakers as they push for the Playoffs. During their last win, Westbrook tied Michael Jordan (and himself) for second-most triple-doubles in NBA history. Westbrook tallied his seventh straight, trailing only the nine straight that Wilt Chamberlain collected in 1968. The Thunder got their second straight win over the Grizzlies. Westbrook not only took home the W, he also took home another triple-double. He finished with 15 points, 13 rebounds and 15 assists, his eighth straight trip-dub of the season. Westbrook is now at solo second in terms of most consecutive triple-doubles in a single season. He needs only two more to own the record. Not bad for a guy who LeBron James traded from his All-Star team earlier in the day. Kawhi Leonard was out due to a sore knee against the lowly Hawks. With the Raptors’ All-Star out, another rising Rap showcased his All-Star potential. Pascal Siakam, one of the leaders for Most Improved Player of the Year led Toronto with a career outing. He scored 33 points and grabbed 14 rebounds, dominating the Hawks frontline all game long. He eclipsed his previous career-high of 30 points he set in January. The Raptors reloaded through the trade deadline today. That will definitely help with future “load management” days for Leonard. But as they showed today with Siakam, they already have all the talent they need.